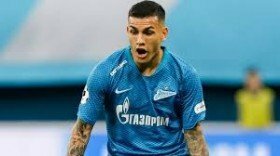 Paredes on cusp of Chelsea move? The 24-year-old, who is currently in the ranks of Zenit St Petersburg, has been linked with the Blues over the past few days and it appears that a move is close to completion after he retweeted a Youtube video which was titled: 'Welcome to Chelsea'. Chelsea are currently looking for a midfield addition after the recent departure of Cesc Fabregas to AS Monaco and this has linked them with the likes of Paredes, Nicolo Barella and Adrien Rabiot. However, it seems that Paredes is the nearest to joining the club in the transfer window, though nothing has been confirmed officially regarding the same from the parties involved. Maurizio Sarri's side recently secured a slender 2-1 league win over Newcastle United and this has helped them create a six-point gap between themselves and fifth-placed Arsenal.